Here’s a simple idea for you and your family to do during the month of November, the week of Thanksgiving, or the day of Thanksgiving with friends and extended family gathered around. 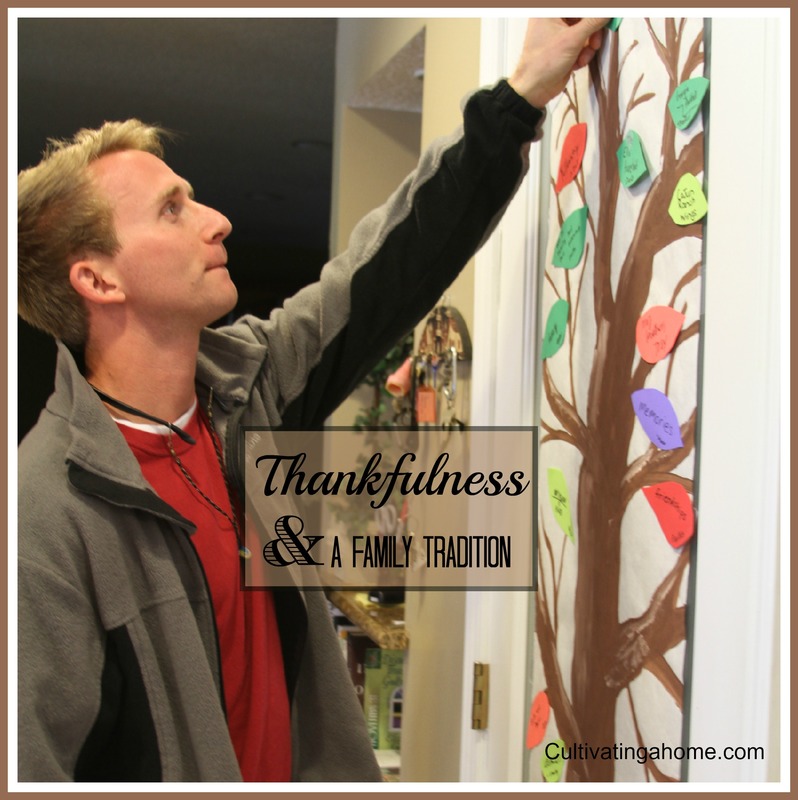 A homemade Thankfulness Tree with cut-out leaves to adhere to record your gratefulness. 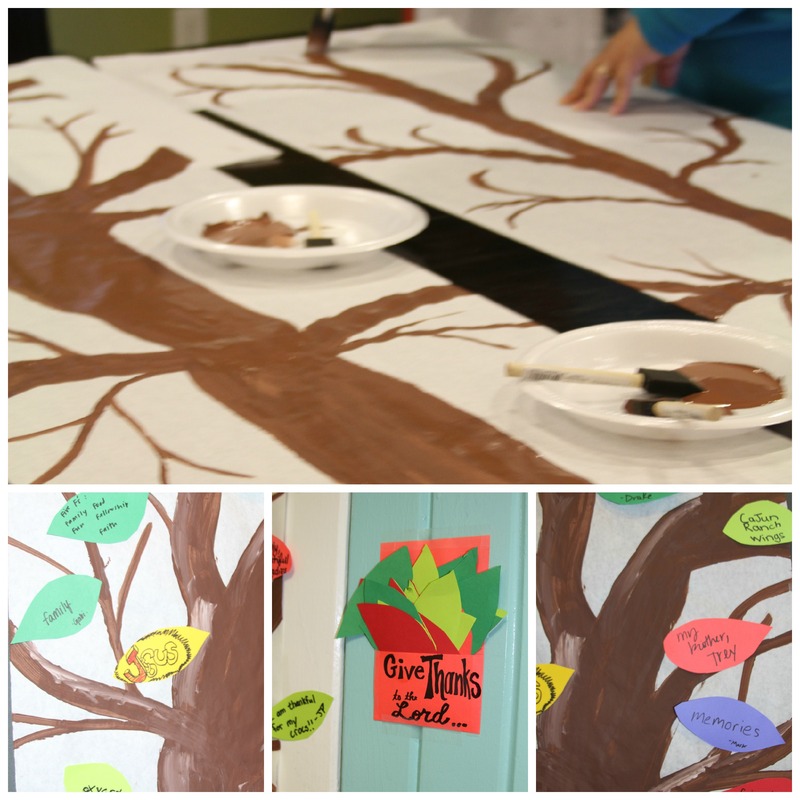 You can write your favorite verses onto leaves, onto the trunk and branches, and do devotionals this month on thankfulness. Enjoy. This just takes some banner paper (I bought a roll of butcher paper at Sams), brown and white paint, construction paper, double sided tape, and a marker. 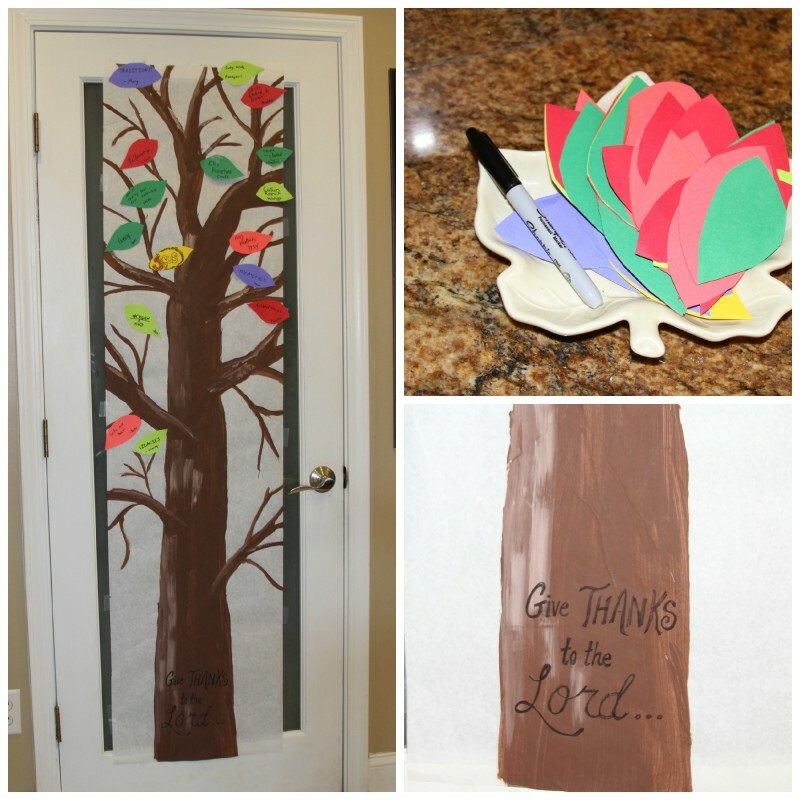 You can have the leaves, marker, and tape sitting near the tree or adhere to the poster or wall. We had our tree up last week so that our out of town guests could be a part of this tradition. 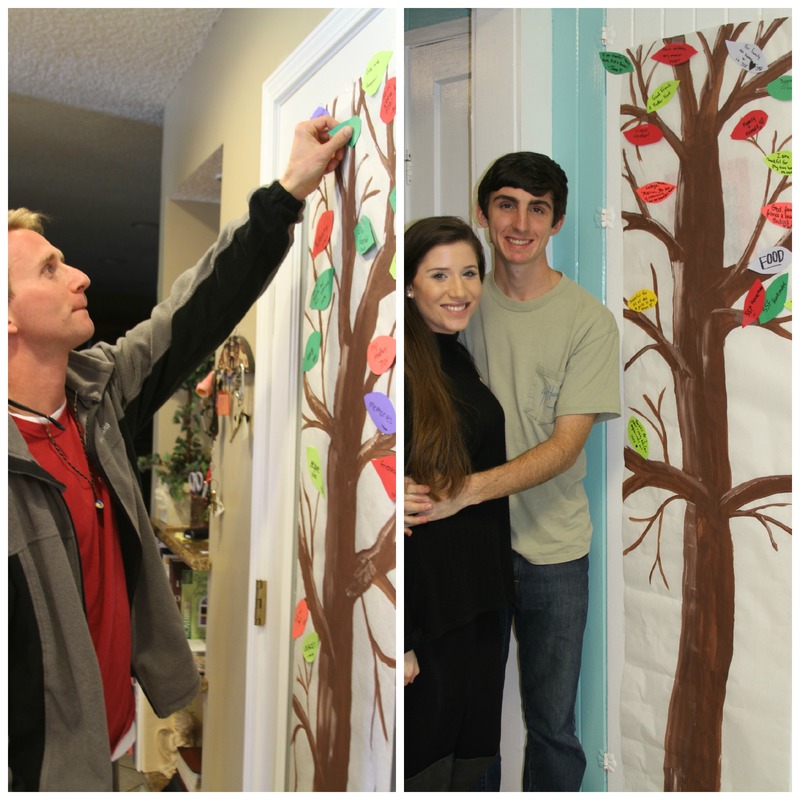 We also took a few Thankfulness Trees to our kids who go to college out of town. With 21 days left until Thanksgiving, here are 21 verses you can read, discuss or use in a family devotional, memorize with your family., or copy onto your leaves and adhere to your Thankfulness Tree. You can follow up the reading of scripture with writing something or someone you’re grateful for and adding your leaf to your tree. I Chronicles 29:13 And now we thank you, our God, and praise your glorious name. Psalm 30:12 That my glory may sing your praise and not be silent. O Lord my God, I will give thanks to you forever! Psalm 105:1 Oh give thanks to the Lord; call upon his name; make known his deeds among the peoples! Psalm 107:1 Oh give thanks to the Lord, for he is good, for his steadfast love endures forever. Psalm 118:1-5 Oh give thanks to the Lord, for he is good; for his steadfast love endures forever! Let Israel say, “His steadfast love endures forever.” Let the house of Aaron say, “His steadfast love endures forever.” Let those who fear the Lord say, “His steadfast love endures forever.” Out of my distress I called on the Lord; the Lord answered me and set me free. Isaiah 12:4-5 And you will say in that day: “Give thanks to the Lord, call upon his name, make known his deeds among the peoples, proclaim that his name is exalted. “Sing praises to the Lord, for he has done gloriously; let this be made known in all the earth. I Corinthians 1:4 I give thanks to my God always for you because of the grace of God that was given you in Christ Jesus. II Corinthians 9:15 Thanks be to God for his inexpressible gift! Philippians 4:6 Do not be anxious about anything, but in everything by prayer and supplication with thanksgiving, let your requests be made known unto God. I Thessalonians 5:16-18 Rejoice always, pray without ceasing, give thanks in all circumstances; for this is the will of God in Christ Jesus for you. Be sure to take pictures of your Thankfulness Tree for great memories. Snap some with each child next to the tree and with some of their leaves in view. Be prepared…when you hang this in your home, your guests will be asking you to make one for them. Tomorrow I’m sharing some photos with you of delivering a few of these trees to our kids at college for them to hang in their houses and share with housemates. You can read that postHERE.